Training programme has been developed in response to a need for evidence-based early interventions for very young autistic children. Designed to help both parents and carers to understand the disorder and how it affects child development and to reduce the severity of emotional/behavioural difficulties by managing a child's particular problems and encouraging effective collaboration between professionals and parents. The Manual for Clinicians explains the purpose and content of each session and includes notes for discussion and teaching, a checklist of 'things to do', and photocopiable task sheets for distribution and discussion. 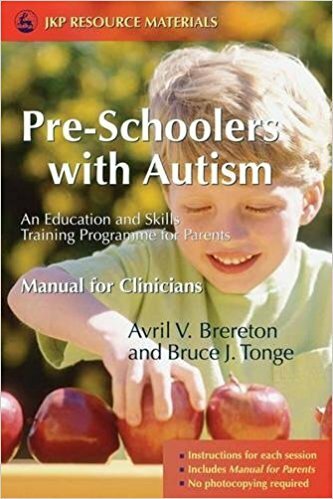 Companion to B 95621 -Pre-Schoolers with Autism: An Education and Skills Training Programme for Parents: Manual for Parents.